With just a few Grand Prix events and the last Pro Tour of the season remaining, the 2015-2016 Pro Season was drawing to an end. The player with the most Pro Points from each country would be invited to the World Magic Cup and the top three European Pro Point earners would be invited to the World Championship, so really a lot was on the line. The race for the top spot was certainly close in several countries, but especially in the Czech Republic, host to this weekend's Grand Prix. With a ninth place finish at Pro Tour Shadows of Innistad (19) Lukas Blohon secured the Platinum Level in the Pro Players Club, and put himself in first place in the race to become the Czech team captain at the World Magic Cup. With 50 Pro Points he was now a mere point ahead of (16) Ondřej Stráský at 49 and three points ahead of Petr Sochůrek, who sat at 47 after a ninth place finish at Grand Prix Manchester two weeks ago. The three Czech mates also found themselves in places four through six of the European Pro Point ranking, trailing Sweden's Joel Larsson at 51, Italy's Andrea Mengucci at 55, and Denmark's Martin Müller at 57. 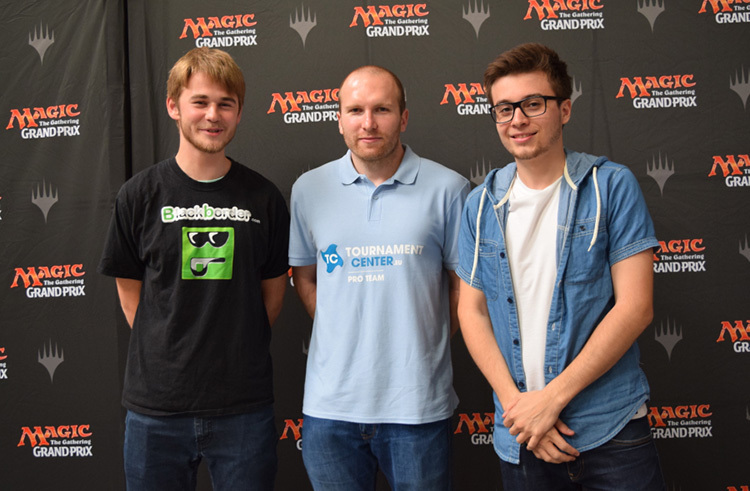 Müller didn't even attend Grand Prix Prague, while Mengucci and Larsson didn't get off to the best start into the tournament. So the Czechs might be able to enter the coveted Top 3 this weekend already. "I have to do better than both Blohon and Stráský at the Pro Tour to become captain. Since we all have so many Pro Points from Grand Prix it will most likely be that tournament that decides it," said Sochůrek. (19) Lukas Blohon, who was currently at the top of the Czech standings, said he wasn't nervous about not making captain. With a broad smile on his face he gladly summed up his successful season so far. "My goal this season was to make Platinum, and I succeded with that before the last Pro Tour of the season. Now I get the benefits for that one and have locked up Platinum for next season, everything else is a bonus. If I make captain I make captain, if not it will be one of the other two guys. It's a very friendly rivalry," he said. Blohon explained that at the beginning of the season he considered this could be his last season of playing as much competitively, unless he reached his goal of Platinum Level. With a Grand Prix victory and a near miss at making a Pro Tour Top 8, his season had been better than he expected. I asked him to explain why. "First of all I've been trying harder than ever. I've taken Magic more seriously this season and have been preparing more. But perhaps most importantly I've worked a lot with Petr Sochůrek, who is a really good player, and as I'm sure you've heard a hundred times, the best way to improve is to talk to and play with other good players, " he answered. The third of the Czech mates, (16) Ondřej Stráský was also the youngest of the gang at 21, which might reflect on his confident answer on who he thought would become the Czech national champion this season. "Me! I have the best team for the upcoming Pro Tour in Australia and I think whoever has the best finish there will win the race. I need to be confident, and since I might be the weakest player of us three I hope that testing with the best team will get me there," he said. The team he's talking about is Face to Face Games, who have been on a rampage on the Pro Tour scene for the entire season. When asked to elaborate, the 21-year-old Prague native said he'd be happy no matter who'd become captain, as long as his finish was good enough to clinch a seat at the World Championship. "It's looking good for me to take one of the slots for the best European Pro Point finishers. And since I was captain last year and didn't enjoy the World Magic Cup as much maybe it's someone else's turn this year. If I don't make it, I hope Petr Sochůrek does, although we are all friends and have tested for a lot of Pro Tours together all three of us. But like I said, in the end I think I am favored, since I have the better team so I give myself a 40 percent chance of becoming national champion," he said.